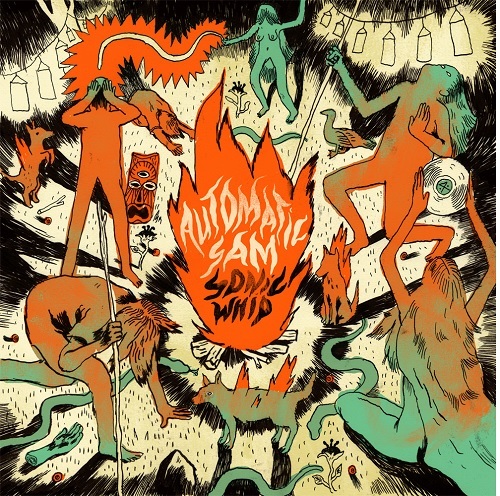 In 2011 Dutch band Automatic Sam released their debut record Texino, which is full of rough blues and rock songs. Unfairly that record didn't get enough attention. The band played a lot in small venues and as support act for De Staat and Black Rebel Motorcycle Club among others. With their steaming shows they established a strong live reputation. Nevertheless they didn't manage to reach a bigger audience. After a few line-up changes the band is now back with their second album, Sonic Whip. On that album the guys show to have grown a lot. The music has become more wide and varied. There's still enough room for the familiar raw punk and rock sound, rooted deeply in the blues. But they are exploring the boundaries and cross them many times, without completely losing it. Instead of continuously going full force, they manage to hold back and that way retain tension. For example 'See You' starts with a deafening intro after which it continues into a more subdued rock song, alternating with carefully placed eruptions. It's what makes the record live up to its title. The foursome is handling the whip skilfully. Now and then they are teasing with gentle strokes, like the varied 'Ghost Town', which only completely explodes at the end. Other songs are ruthlessly scourging the listener like the great first single 'Set It Right'. The song is rumbling all over you with well aimed punches in the face. This way you never know what's coming. The band knows exactly when to sound overwhelming with hard riffs, pounding grooves and rolling fills. That last one is understandable when you know De Staat's drum monster, Tim van Delft, has taken over the drum throne. Pieter Holkenborg increases the tension even more with his vocals. Sometimes he's screaming his lungs out and then continues, whispering mysteriously. Automatic Sam can be really proud of the gem they created. It is easily one of the best records of the year. The LP has been released on Quadrofoon Records, where that other one of a kind rock band Shaking Godspeed is releasing their music. Like that group, where Holkenborg once played the drums for a few years, they are the pick of the bunch of the Dutch rock scene at the moment. Automatic Sam is playing all over the country at the moment so go see them when you get the chance. Listen to Sonic Whip on Spotify.